Composting is an affordable, environmentally-friendly way to encourage the growth of your garden and help your soil retain water. It prevents garden diseases and pests while encouraging the production of helpful bacteria and fungi, which nourish plants naturally as well. Composting food scraps and yard waste not only saves you money on garden products, it keeps this waste out of landfills, where it takes up room and produces methane, a harmful greenhouse gas. 20 to 30 percent of garbage actually consists of organic material, which could be used to benefit plants! This process requires three ingredients: browns, greens, and water. Dead leaves, branches, and twigs are examples of brown materials. Greens include grass clippings, vegetable waste, fruit scraps, and coffee grounds. 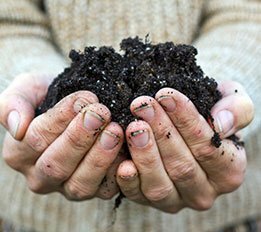 Ideally, compost consists of equal parts browns and greens, with alternating layers of different-sized materials. When combined, these substances react, resulting in the perfect food for plants. The browns produce the carbon, the greens produce the nitrogen, and the water breaks down the organic material. To compost in your backyard, you might need the following tools: pitchforks, square-point shovels or machetes, and water hoses with spray heads. First, set up a compost pile or bin in a dry, shady area next to a water source. Add browns and greens as they become available, making sure to moisten them and chop or shred the larger materials. As your pile grows, it’s a good idea to bury fruit and vegetable waste ten inches deep. You want your compost pile to maintain its moisture, so you also might want to cover it using tarp, for example. Maintenance involves turning and watering the compost regularly. You’ll know that your compost is ready to use when the material at the bottom becomes dark in color, which can take between two months and two years. It’s also possible to compost indoors, as long as you purchase an appropriate bin for your pile and keep it maintained. If your greens and browns are turned and watered often enough, the compost shouldn’t attract pests or produce any odor. An indoor compost pile is particularly convenient; it can even be ready for use relatively quickly, only needing to sit for two to five weeks. Speaking of convenient, you can actually build your own indoors compost bin out of available plastic garbage cans! Not everyone has enough yard space to compost outside, so this is a great alternative. Choose appropriate containers based on the amount of compost you want to produce. Drill holes in the bottom and sides of the larger can that are half an inch in diameter. Ground the larger can by placing a brick at the bottom of it, add a layer of wood chips or soil, and put a smaller can inside so that it rests on top of the brick. To help it retain heat, wrap insulation around the larger garbage can then cover it with a lid, and voilà! You’ll have usable compost in no time.